Venezuela: Neither Dictatorship, nor democracy. For self-organization and intensification of social conflict. Originally published by Indymedia Venezuela. Translated by Abolition Media Worldwide. Today we await a new chapter of the historical cycle opened by the insurgency of the crowds at the end of the last century and the beginning of this one against the offensive of the warlike-spectacular society in the territory controlled by the Venezuelan state. The meeting point of contradictions and conflict was called to inaugurate–with the Caracazo–a cycle of rising social and political conflicts that both the bourgeois opposition and Chavismo wish to close–with different variants and rhythms–in favor of the restructuring of capitalist society. In this chapter of the historical plot are placed on the one hand the government and Chavez state, spearhead of progressive Latin American governments that today are torn between organized withdrawal and disbandment, already having fulfilled their role of disciplining and domesticating the crowds with the price of raw materials rising, as they adjusted to the demands of capitalist looting. They then implement and carry out the adjustment and repression that the neo-liberal governments could not carry out. Thus the government led by Nicolás Maduro and the military scoundrel on which his power of fire is based is responsible for more than 250 murders in social protests since 2013 at the hands of the repressive apparatus (and more than 35 murders are included in the last 10 days), for hundreds of extrajudicial executions both in the streets and neighborhoods and in prisons in recent decades, for persecution, prosecution and murder of social fighters, huge rates of femicides and killings of trans people with complicity and concealment of judicial power, in addition to thousands of cases of malnutrition and deaths in hospitals. The same government ceded 15% of the territory to extractive capital for the extraction of gold, bauxite, coltan, etc. in open-pit mining, with the Orinoco-AMO-Mining Arc, thus adapting the territory and the crowds to the demands of capital and the construction of infrastructure for its looting (IIRSA), while deepening subordination and interference in the territory by the Russian and Chinese states through loans, indebtedness and concessions. On the other hand, the bourgeois opposition is the champion of reconfiguration and the current offensive of warlike-spectacular capitalism that extends into the Latin American territory, offshoots of the old Venezuelan oligarchy and its neo-liberal program outlined in its “Country Plan,” where, for example, Entrepreneurship and its totalitarian logic of profit would sculpt national reconstruction at the hands of the IMF and global capital. The same opposition now cries out to a dissatisfied military faction in the distribution of power, thus leaning on the infamous Uncle Sam and the Latin American and world powers to promote an exit and intervention in their favor in the dispute for the management of the political order and society by postulating an eventual transition from the hands of the military and imperial pack. Thus the warlike-spectacular capital nucleated in the US and its satellite states is the weapon used by the bourgeois opposition to unlock the conflict and set a precedent in the form of intervention of global capital in the Latin American territory–an intervention form that has its echo in the last century–to build and consolidate an offensive of the states and capital in Latin America, thus closing the historic cycle opened by the Caracazo. Our proposal: conflict. In this framework, there is nothing worth defending or rescuing, be it democracy, rights, revolution, democratic liberties, socialism. Cleaning is not done in a collapsing house. The defensive resistance does not have the slightest sense; instead we call for a self-organized offensive from the autonomous and horizontal bases, sharpening social conflict–which both the bourgeois opposition and Chavism fear so much–in the streets, neighborhoods, countryside, factories, high schools, universities, etc. No state, government or authority of any kind will solve the problems of the multitude, as the problem of the multitude is authority in all its manifestations. Thus only self-organized force, the development of organizations and combative methods in the heat of social conflict and its aggravation through direct action, in addition to the necessary coordination of actions and extension of solidarity as a weapon among the multitudes, would be the course that would mark a gap on the horizon different from the storms conjured by power that loom over our heads. That is to say: The emancipation of the multitudes will be the work of the multitudes themselves. 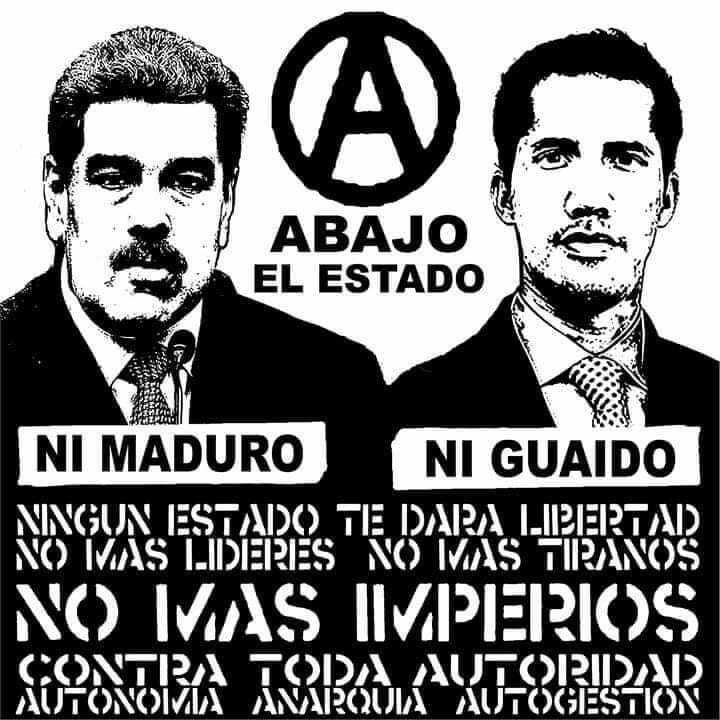 NEITHER MADURO, NOR GUAIDO! NEITHER DICATORSHIP, NOR DEMOCRACY! NO STATE OR EMPIRE WILL GIVE US FREEDOM! THE EMANCIPATION OF THE MULTITUDE IS A WORK OF THE MULTITUDE ITSELF! Keep the Enough 14 blog and the Enough 14 Info-Café going. You can do that with a donation for our work in the Enough 14 info-café and our independent reporting on our blog and social media channels. Even 1€ can make a difference.